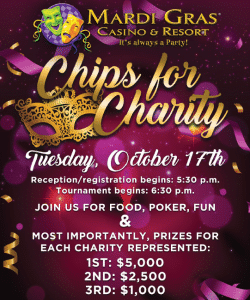 It is time once again for the annual Chips for Charity Event brought to you by Mardi Gras Casino & Resort. The date is set for Tuesday, October 17, 2017 at Mardi Gras beginning with reception at 5:30 p.m. and official play at 6:30. There is plenty of delicious food and spirited drinks. The game is Texas Hold ‘Em Poker. Each charity is represented by 1 player and every charity/player is guaranteed at least $100 for participating. Mardi Gras is looking for charities (501c3) who might be interested in participating. Call Rachel at 304-776-1000 ext. 1322 to register or get more information. ALL TOURNAMENT PLAYERS RECEIVE A VALUABLE GIFT BASKET FOR PARTICIPATING!